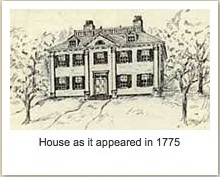 When Martha Washington joined her husband in Cambridge, Massachussetts, in December, 1775, they lived in the former home of John Vassal, which served as Washington’s Headquarters. (He had previously occupied space in Wadsworth House, the home of the president of Harvard.) It was in a section of Brattle Street known as Tory Row for the number of houses built there by wealthy Loyalists. Vassal had left when war threatened, and his property was seized by the Americans. The house was later lived in by Henry Wadsworth Longfellow and has since become a National Historic Site. Martha wrote to her sister with details about both their family and the military situation. I have wrote to you several times, in hopes it would put you in mind of me, but I find it has not had its intended affect. I am really very uneasy at not hearing from you and have made all the excuses for you that I can think of but it will not doe much longer. If I doe not get a letter by this nights post I shall think myself quite forgot by all my Freinds. The distance is long yet the post comes in regularly every week—The General, myself, and Jack are very well. Nelly Custis is I hope getting well again, and I beleive is with child. I hope noe accident will happen to her in going back [to Virginia]. I have not thought much about it yet god know whare we shall be; I suppose thare will be a change soon but how I cannot pretend to say—A few days agoe Pokies Gen [Henry] Clinton, with several companyes Sailed out of Boston Harbor to what place distant for, we cannot find out. Some think it is to Virginia he is gon, others to New York—they have been keept in Boston so long that I suppose they will be glad to seek for a place where they may have more room as they cannot get out anywhere here but by water—our navey has been very successful in taking thair vessels; two was taken last week loded with coles and potatoes wines & several other articles for the use of the troops—If General Clinton is gon to New York,—General Lee is there before him and I hope will give him a very warm reception,—he was sent thare some time a goe to have matters put in proper order in case any disturbances should happen, as thare are many Tories in that part of the world, or at least many are susspected thare to be unfreindly to our cause at this time—winter hear has been so remarkable mild the Rivers has never been frozen hard enough to walk upon the Ice since I came heer. Martha’s letter is on pages 41-42 of In the Words of Women. There are several interesting POSTS by J. L. Bell on Washington’s taking command of the troops outside of Boston. He has written a book George Washington’s Headquarters and Home—Cambridge, Massachusetts containing much information for those who wish to read further about the general and his entourage.